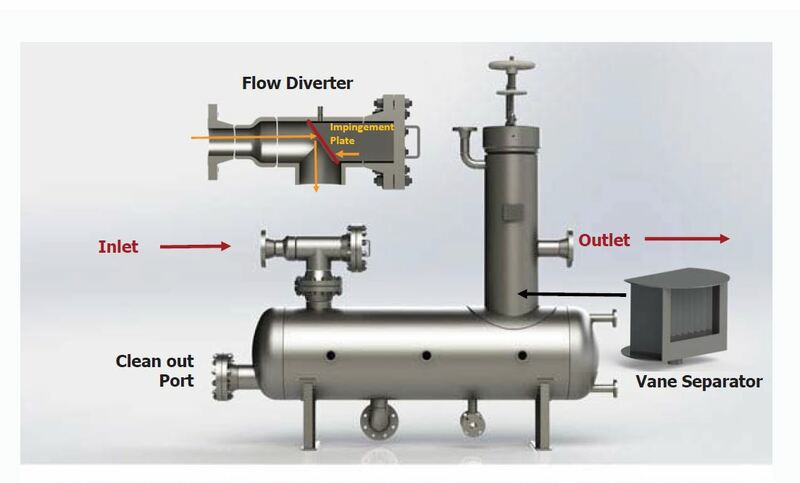 Based on requests from companies working in the mid-stream processes we realized that there is a need for a DeSander – DeLiquidizer – Coalescer to remove particles of sand coming out of the wet gas, found in the Marcellus Shale Play, near the well head. Because of higher pressures of the gas leaving the well, the velocity of the sand has eroded process equipment. With this problem in mind, TM Filtration has designed the “Inline” DeSander using an impingement device with a deflector. While we were working on this project, we received a request for quote from our representative in Venezuela, Conare, C.A. They were looking for a product that was designed as a DeSander with a vane separator to remove oil mist. They projected about one liter of oil per hour. Since the amount was small, we designed the unit with an 80-gallon Receiver / Separator as the base. To improve the performance of this unit, we engineered the inlet and outlet to be “in-line” to fit a standard piping formation. This particular unit is specific to the application in Venezuela. We are in the process of updating our catalog and when it is complete other sizes and models will be available that will meet various customer requirements relating to liquid conditions and measured flows. Unit Operation: The wet gas separates from the liquid condensates and the sand settles in a compartment in the bottom of the receiver. The wet gas then flows through the separator and then enters the vertical tower that houses the vane separator. The separator removes all liquids down to 10 micron. 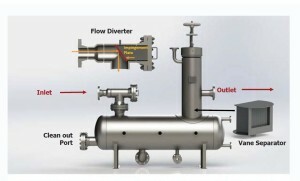 The almost dry gas then moves into the gas coalescing chamber (GFM Technology®).